Infrareligion in the abyss: on Jaime Rodriguez Matos’ Writing of the Formless: José Lezama Lima and the End of Time. By Gerardo Muñoz. Jaime Rodriguez Matos’ Writing of the Formless: José Lezama Lima and the End of Time (Fordham U Press, 2016) is an ambitious and truly mesmerizing mediation on the Cuban poet José Lezama Lima in light of contemporary theoretical debates concerning the status of the political in the wake of Modernity’s decline into nihilism. Rodriguez Matos’ sophisticated intervention attempts to accomplish several objectives at once, and in this sense, the book does not pretend to be an exegetical or philological contribution to scholarly debates on the poet. Rather, in the book, Lezama is taken as a poet-thinker of the informe, whose main import into Western history of writing and thought is that of a ‘writing of the formless’ (Rodriguez Matos 171). In its totality, the whole book is a groundwork for such a claim, and it works through a series of tropologies, figures, and debates that extend from Lezama’s specific cultural Cuban context and its readers, to a set of wider debates pertinent to Left-Heideggerianism, political theology, or the event (although by no means, is the complex set of debates reducible to these three philosophical indexes). If one were to describe the project in its most far-reaching ends, Writing of the Formless is important yet for another reason: by handling several topologies of Lezama Lima’s oeuvre, we are offered an in-depth analysis of the intricate conceptual wager in infrapolitics, or in infrapolitical-deconstruction, which as Rodriguez Matos suggests, is the provenance of Lezama Lima’s contribution as a critical task. The book is divided in two parts. In the first one, four chapters grid an explication of the problem of time, as well as that of the formless, revolution, and nihilism. In the second, Rodriguez Matos engages in an innovative reading of different zones in Lezama Lima that evidence the destruction of principial politics, and the opening towards an (infra)politics of the void. In this review, I can hardly do justice to a book that I truly consider a masterwork of contemporary thought. In my opinion, this monograph comes as close as it gets to being flawless in establishing conceptual premises and argumentative deployment. In what follows I will map some provocative elements of his exposition, in hope that it will be a starting point for a discussion with those critically engaging Latin America, the political, and the stakes of thought in our time. “But it now it seems that in fact modernity, and not any possible redemption or liberation from its political and economic deadlocks, is itself a mixed temporality that is constantly battling between a circular and a linear time – a linear time of alienation and a circulation teleological time of redemption. The two need to be taken together, even in the very (im)possibility of such a synthesis. And this would mean that modernity is no longer the other of the revolutionary interruption of empty chronological time; rather, these are two sides of a single coin” (Rodriguez Matos 33). “…beyond the politization of politics, and beyond the image of time as synthetic operation, what remains is the possibility of thinking with the poet beyond the current apparatus of academic-imperial) knowledge and all of its returns” (Rodriguez 25). One would not exaggerate much in concluding that Lezama Lima as a thinker of the informe becomes the necessary antidote and hospitable dispensary against the philological exercises of the traditional belleletrism, but also of decolonial and neocommunist designs that, although attempting at the surface to break-away with imperial semblances, end up carrying the guise of principial politics as the highest flagpole for self-legitimation. The reading of the informe allows us to move beyond the temporal dichotomy between revolution and conservation, messianic originalism (such as that of catholic, later convert post-socialist official poet Cintio Vitier), and the multiplicity of historical time (such as that endorsed by Rafael Rojas, Cuba’s most sophisticated neo-republican intellectual historian). It must be noted, however, that many other intellectuals and thinkers are tested on this basis. The common ground shared by diverse thinkers such as Rafael Rojas, Ernesto Laclau, Cintio Vitier, Walter Benjamin, Bruno Bosteels, Alain Badiou, and those that subscribe to post-foundationalism becomes clear: mainly, the assumption that the crisis of nihilism of temporality can be amended by always providing an adjustment for the abyss. In this way, Rodriguez Matos offers a frontal critique of any claim instantiated in hegemonic phantasms: “Our task remains to think time in all its radical complexity – that is, to think time as something other than a solution” (Rodriguez Matos 44). Writing of the Formless stands up to this deliverance. There are many important elements that come forth in this argumentation, one of them being that the covering of the formless, or the lack of foundation, is usually articulated through a master and masterable political theology. It is not just Rodriguez Matos who arrives at this conclusion, but also Bruno Bosteels by way of observing the inscription of Christianity in many of contemporary thinkers of the Left. In a passage cited by Rodriguez Matos from Marx and Freud in Latin America, we read: “All these thinkers [Badiou, Negri, Zizek], in fact, remain deeply entangled in the political theology of Christianity – unable to illustrate the militant subject except through the figure of the saint” (Rodriguez Matos 44). It is even more perplexing then, that Bosteels’ own solution to this problem ends up being just more political theology by way of Leon Rozitchner’s reading of Saint Augustine, and merely exchanging the category of the saint for that of the militant subject, even though this is already part of the history of alienation of Christianity . But the reason for this might be, as Rodriguez Matos thematizes a few pages later, that any predicament for politization as supreme value today needs to ascertain some sort of militant subject of the event in order to guarantee a consensus on “contemporaneity”, and in this way avoids what the present is or what it actually stands for (Rodriguez Matos 109). The chapters 2 (“Sovereignties, Poetic, and Otherwise) and three (“The Mixed Times of the Revolution”) attend to how the question of time was conceived within the Cuban Revolution. This framing, one must first note, already dislocates the grounds of the discussion centered on the sovereign or the caudillo, a fetish so dear to both revolutionary and liberal imaginations when confronting the ‘Latinamericanist object’. Hence, in chapter two, Rodriguez Matos advances a demolishing reading of the temporality of foquismo, although not on the grounds that one could have imagined. From a historiographical standpoint, it is common to agree on the fact that that both Guevara and Debray’s formulations have little substance in historical experience, since they are theoretical fictions that develop to master a non-repeatable event (the Cuban Revolution), which was far from being successful solely because of the foco guerrillero in the first place. But this is not Rodriguez Matos’ critique. The argument is set up to make the claim that the Revolution, in order to become flesh and conceive the unity and sameness with the people, theory must be first discarded (Rodriguez Matos 60). Rather mysteriously, in foquismo it is the people that ‘act’, while Guevara becomes its narratological supplement. This is the inversion of the Leninist principle that alleged that in order for a revolution to materialize it needs a good theory beforehand. “For the metaphysics in question already relies heavily on the form in which it makes multiple small narratives. For the metaphysics in question already relieves heavily on the form in which it makes multiple temporalities appears together. That is, modernity is fundamentally and internally committed to the constant confrontation of disparate forms of time. Instead, I suggest taking a closer look at the time of lost time, the time of the void, and what might happen when it is not filled in but, rather, allowed to resonate in all its formlessness.” (Rodriguez Matos 61). How should we understand this echo? The turn to Celan and Heidegger’s immersion in noise and the ontological difference validates immediately any vacillation in the answer, since what is at stake is ultimately to think not the “standstill of all time” of the messianic force, but our being in time understood as our most basic and intimate relation that we have with time (Rodriguez Matos 70). It is only this absent time of the formless that will be one of majesty, capable of undoing sovereign authority and its governability over the singular. The third chapter moves against the belief that Lezama Lima can be grasped in interested disputes regarding his intellectual provenance, political ideology, or assumed Catholicism (origenismo). This is an arduous task, but Rodriguez Matos makes it look easy through a threefold operation. First, Lezama is moved beyond the antinomies of secularization and aesthetics, placed in the proper site of the religion of the formless (we will come back to this). Secondly, Rodriguez Matos confronts Lezama’s own interpretation of the Revolution as parusia or Second Coming, which coincides perfectly with Guevara’s own model of the “ways things are” that folds revolutionary Cuba into globalization due an ingrained total administrate apparatus over life (Rodriguez Matos 93). This entails that revolutions, if we take the Cuban experience as metonymic of the phenomenon, are always already biopolitical experiences, even though Rodriguez Matos does not frame it in such terms. Third, by understanding the ‘mixed’ temporality of communism and revolutionary politics as convergent with the temporality of capitalism, we come to understand that the second is always on reserve in the backdrop of the state and its institutions (Rodriguez Matos 96-97). In sum, the superposition of revolutionary times with the time of capital is here shown, once again, to be two sides of the same dual narrative of modernity that turns away from the abyss at the heart of politics. This complicates many, if not all, of the assumptions that Cuban transitologists have disputed with very futile outcomes, in my opinion, in the last decade. Finally, the fourth chapter “Nihilism: Politics as the Highest Value” rightly places the question of nihilism at the center. This is a return to the question of political theologies discussed above. Whereas many of the thinkers on both sides, republicanist and communist alike, take up the question of nihilism, the result, according to Rodriguez Matos, is that it is presented as a fight against those that think the problem of nihilism. Thus, the “banality of nihilism must be dismissed or critiqued” (Rodriguez Matos 104). The operation rests on the fact that the question of being must be avoided at all costs. And this is achieved in at least two main forms: discarding nihilism by proposing a “multiplicity of times” (Rojas), or by proposing a “living philology” (Vitier, Bosteels) that would be able to restitute a truth of a text of the past to give proper political ground (Rodriguez Matos 115). Now the tables are turned, and those that seek to cover the void, as if that were an option, appear as agents of a true nihilistic force. “Ultimately what is at issue whether there is a difference between those texts of the Western tradition that forget the question of being and those whose starting point is the challenge and the difficulty that the question poses, the challenge and the resistance involved in dealing with the ground that is and is not there in its absence. What is at stake is whether or not it is possible to imagine a writing and a thought that do not simply fall silent in order to guarantee the continuity of the narrative of legitimacy and sovereign authority in the poem or in politics – but the link between these two is also at issue here. That is, whether or not it is possible for posthegemonic infrapolitics to be something other than the trace of politics” (Rodriguez Matos 136). What immediately follows is a series of closely knit constellations of the writing of the formless as absent time in Lezama, which I can only register here without much commentary: Lezama’s own critique of T.S. Eliot’s notion of the difficult, a critique of Garcia Marruz’s reading of the aposiopesis as rhetoric’s hegemonic property, Lezama’s understanding of Aristotelian metaphoricity; Lezama’s philosophy of an atopical One, and finally Rodriguez Matos’ own conceptual position of Lezama as an infrareligious and infrapolitical figure that pushes politico-theological legislation of principles to their very limit into a ‘nonsynthesizable reminder’ [sic] (Rodriguez Matos 154). Further, Lezama’s vitalist response to the Platonist pros hen, unlike the immanentist modern reversal, concludes in a Platonist affirmation instead of an overcoming of Platonism (Rodriguez Matos 139). Rodriguez Matos intelligently resolves this bizarre multiplicity vis-à-vis a parallel reading of Paul Claudel, who rejects aposteriori knowledge in exchange for the cognizant objectification of God before the sovereignty of the Poet. Although I am left thinking about the status of Neo-Platonism as it relates to the discussion of Christian Trinitarian thought . “For part of what I am calling attention to is the fact the staging of the formless in Lezama involves a thematization and an awareness of what should only be there as trace. This awareness goes beyond a more familiar claim regarding the self-deconstruction of discourses of their own accord – this is, after all, also what the trace is supposed to underscore. I would like to read this excess of awareness as a radicalization of deconstruction” (Rodriguez Matos 176). This radicalization will entail leaving behind the moment of ecriture, which characterized the first wave of deconstruction in literary fixation and textual playfulness. Infrapolitics will be, programmatically speaking, post-deconstruction, or what Moreiras has recently called a second turn towards instituted deconstruction . But the question remains: is infrapolitics then, a trace of politics? It is an unresolved question, but perhaps the most important one. Rodriguez Matos leaves us a clue at the very end of the book. When discussing the baroque – and let’s not lose sight of the fact of how late the question arrives, which is a merit and not a pitfall – Rodriguez Matos cites a letter of Lezama to Carlos Meneses: “I think that by now the baroque has begun to give off a stench” (Rodriguez Matos 181). The Baroque has come become an exchangeable token for the Boom, the last stage of identitarian transaction. But it is more than this: the baroque can no longer account for the informe at the heart of the image and rhythm. Let’s probe this further. If the baroque is now exhausted, it is because all politics of the frame are insufficient to cope with the formless. The primacy of the critique of political economy today, for example, remains just one of its last formal avatars. But one could also respond to Rodriguez Matos’ final invitation, and say that while the aesthetic program of the baroque is demolished or turned into ashes, perhaps a trace of it remains in posthegemonic politics. To the extent that we understand the baroque as a political of self-affirmation against Imperium beyond hegemony, the baroque necessarily entails a republicanist politics . In other words, while the infrareligious trace depends on the abyss, posthegemonic politics of republicanism sprouts from the baroque in early modernity against any imperial and counter-imperial conversions. Rodriguez Matos interchangeably speaks of infrapolitics and posthegemony throughout the book, therefore this nuance could be taken as a radicalization of the second term in line with the disclosure regarding the baroque. Post-deconstructive infrapolitics remains open. But if Lezama’s legacy is waged on having confronted the formless abyss of the absent time; perhaps, the author of Dador can also reemerge as a political thinker and existential representative not of Paradise, but of the secret Republic. This will entail a republicanism that, in each and every single time, does not longer participate in the eternal arcanum. This does not mean that St. Augustine cannot be read against the myth of political theology. Such is the task that José Luis Villacañas has accomplished in his Teología Political Imperial: una genealogía de la division de poderes (Trotta, 2016). In my view, Rozitchner’s La Cosa y la Cruz (1997) is a flagrant misreading of Augustinian anti-political-theology in exchange for a superficial materialist affective analysis. Although I do not have space to discuss this at length, I must note that Rodriguez Matos’ discussion of contemporary materialisms is also a timely warning about the easy exists that the so-called “materialisms” offer today as an effective transaction in contemporary thought. For his discussion of materialism see, pgs. 104-108. The question of Neo-Platonism is a fascinating story by itself, which speaks about the multiple in the One. Pierre Hadot studied its influenced in debates of early Trinitarian thought in his work of Marius Victorinus; recherches sur sa vie et ses œuvres (Paris: Etudes augustiniennes, 1971). Now, it seems that Lezama Lima himself was not foreign to Plotinus and Neoplatonism, which he linked it to the emergence of the modern poem. In fact, while reading Writing of the Formless, I revisited my copy of Lezama Lima’s unpublished notes in La Posibilidad Infinita: Archivo de José Lezama Lima, ed. Iván González Cruz (Verbum Editorial 2000). It was interesting to find that in “Oscura vencida”, a fragment from 1958, Lezama writes: “Si unimos a Guido Cavalcanti, March, Maurice Sceve, John Donne, en lo que puede ser motejados de oscuros, con distintos grados de densidad, precisamos que sus lectores, puede ser los más distinguidos cortesanos, o estudiantes que versifican cuando la hija del tabernero inaugura unos zarbillos…Con una apresurada lectura de la Metafísica de Aristóteles, sobre todo su genial concepto del tiempo que pasa a Hegel (sic) y a Heidegger; con cuatro diálogos platónicos, donde desde luego no faltara el Parménides. Con algunas añadiduras de Plotino sobre la sustancia y el uno…ya está el afanoso de la voluptuosos métrica en placentera potencialidad para saborear una canción medieval, un soneto del renacimiento florentino, o una ingenua aglomeración escolástica que se quiere sensibilizar, o una súmala de saber infantil, regida por un pulso que no se abandonó a la plácida oficiosa…” (252). This does not necessarily dodge Rodriguez Matos’ discussion of Claudel, but complicates it, since the trinity also merges at different points throughout the book. My question is whether any discussion of Trinitarian co-substantialism is still embedded in metaphysical structuration as potentia absoluta, or if Lezama’s informe is a Parthian attack against this influential model of absolute potentiality by turning it into a monstrous infrareligion. At stake here is also the issue of ‘reversibility’ that is obliquely exposed at the end of the book (Rodriguez Matos 189). 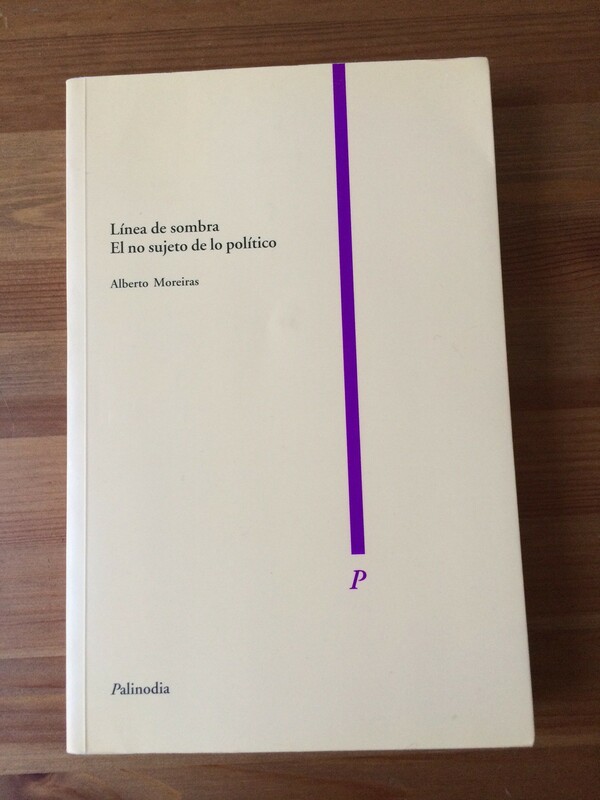 The question of the republicanist politics, Imperium, and the baroque is studied in detailed in Ángel Octavio Álvarez Solis’ La República de la Melancolía: Politica y Subjetividad en el Barroco (La Cebra, 2015). Marranismo e Inscripción (Escolar y Mayo, 2016) traza un itinerario en tres estadios, cada uno marcado por efectos narrativos de sujeto que se descomponen en cada uno de sus tramos, como huellas borradas: la autobiografía/autografía intelectual, la entrevista-conversación, el ensayo teórico, la lectura interesada. En su centro aparece un dispositivo y un cálculo en los que el pensamiento se narra como huida para terminar convertido, en su tránsito por la escritura, en causa y razón, en militancia incluso. La autografía, la escritura como inscripción, permite a Moreiras, permutar la narrativa de un sujeto académico plenamente interpelado por la institución por una práctica de lo propio desde su afuera. Su propuesta se nos presenta como una táctica de apropiación de lo que se mantiene externo a la institución: la existencia y su facticidad, lo absolutamente singular en su contingencia. Así la escritura de propio, el autografismo del marrano, se externaliza para convertirse en herramienta de transmisión no circunscrita ya ni a la enseñanza ni al saber; enfrentada a la producción de consenso a la que tiende el aparato académico y a su reducción de la transmisión a enseñanza, saber y disciplina. La institución no puede interpelar a lo propio, en tanto lo propio es un ejercicio de singularidad que no pertenece a la narrativa de sujeto. Lo propio funciona en el texto como un enigma estructurante. Moreiras es el enigma y el no-sujeto que se escribe frente a nuestros ojos mientras se descose como académico, como miembro de la institución y acatador de sus leyes. Lo que transmite aquí Moreiras es la fidelidad a una idea impersonal que excede al sujeto. Se trata de un cálculo que está ahí desde el principio como intuición y que sólo puede vivirse como error o falta. Diría incluso que esa impersonalidad está en el centro de la tragedia académica a la que se alude como trauma del sujeto. La academia solo acepta y produce sujetos plenamente interpelados, todo lo demás simplemente no existe. En ese sentido es una estructura schmittiana de gobierno, no solo de amigo/enemigo, sino de sujeto y no-sujeto. El no-sujeto de lo impersonal no tiene cabida en su seno pero es también justamente el exceso impersonal lo que sobrevive a su tragedia, a la pérdida del cobijo académico y su producción de identidades. “…no el yo que vela en la noche, sino la noche que vela dentro del yo despojándose de su rol de sujeto, de su identidad de persona, de su capacidad de imputación. Un acontecimiento, llegado desde afuera y dirigido hacia fuera, que se sitúa en un nivel completamente exterior respecto a la esfera personal de la conciencia.” (Esposito, 187). El insomnio que acecha el subtítulo de Marranismo e inscripción: ‘Más allá de la conciencia desdichada’ alude a una escena originaria en la que la pérdida es aún solo eso. La lucha agónica y especular entre la primera y la segunda persona de “Mi vida en Z”, su tragedia, queda a lo largo del texto definitivamente desplazada en favor de una tercera persona que es a la vez singular y plural, ya que se relaciona con el mundo a través de su diferencia y nunca de su identidad interpelada. La solución está no solo en asumir la pérdida sino en celebrarla. El proceso no es reversible porque la lógica ternaria es irreducible ya a la binaria. No hay vuelta atrás: adiós a la conciencia desdichada. Good riddance! El dispositivo teórico de Marranismo e inscripción demanda una estructura triple, liberada finalmente del agonismo trágico del diálogo a dos bandas (la lucha a muerte entre el tú y el yo que la institución demanda). A mi personalmente este dispositivo me recuerda un poco a la passe lacaniana, que es también la inscripción de la voz de la tercera persona, un salto de la tragedia a la política de la comedia, a su picaresca, a su ‘make-do’ con lo dado. Así, la relación central del texto, la relación entre vida y pensamiento, bios y logos, deja también de ser binaria una vez aceptamos que ni la una ni la otra coinciden con la subjetividad y sus trampas. La vida pensante que ejerce el “moralismo salvaje” propuesto por Moreiras solo puede ser impersonal, cómplice con la facticidad del mundo y su exterioridad. En la textualidad misma de Marranismo e inscripción se produce otra no coincidencia, esta vez entre la letra y la voz, la aporía en la que texto se instala. El desborde producido por la voz propia amenaza con descoser la continuidad de la letra y su capacidad de construir una opción de lenguaje subjetiva. La singularidad de la voz es un índice de su exterioridad: la voz es siempre otra. Y escuchar la voz en la letra es desdoblar su identidad y su identificación monológica. La voz es siempre marrana y la cuestión es cómo sostener esa tonalidad en el acto de la escritura. Es ahí donde la picaresca de la voz de Alberto actúa como soporte de su marranismo, como antídoto a la institucionalización de su escritura. Asimismo, asumir el accidente del marranismo (el “no querer estar nunca allí donde lo ponen”, 49) es un acto de voluntad política y una entrada en un mundo más allá del yo que demanda la incorporación de lo ajeno como propio. Se trata pues de un acto retroactivo que señala la extraversión como momento de inflexión; inscripción que transmuta la necesidad en elección, lugar al que sólo se llega después de pasar por el desierto y verse de bruces enfrentada a lo que no es “ni inagotable ni subsumible” (Moreiras, 56): la existencia como resto y como supervivencia. Algo que convierte a la precariedad de la superviviente, que sabe bien de la fragilidad del sujeto como cobijo, en condición voluntaria desde la que iniciar un ergon propio. Una práctica de no-sujeto que ponga a trabajar el tiempo exterior de la existencia, su singular facticidad, la de una vida no intercambiable con ninguna otra. *Position Paper read at book workshop “Los Malos Pasos” (on Alberto Moreiras’ Marranismo e Inscripción), held at the University of Pennsylvania, January 6, 2017. What is the relation between negative engagement and deconstruction? Negative engagement is a singular engagement of separation that instead of proposing a binary problem/solution proper to contemporary thinking, offers new questions and the possibility of pushing thought further. It is negative since it does not look for empathy nor compassion, neither redemption nor recognition. It is an engagement that abandons the “state of things”, only to open up thought to the unthinkable, and to the difficult experience of freedom. It is engagement as a form of life, since what is at stake is a relation to existence outside of hegemony, identity, and quality; that is, at the margins of institution (if there is such a thing anymore). In Moreiras’ anti-book, Marranismo e Inscripción (Escolar & Mayo, 2016), we bear witness to such a difficult intervention. It is a book made up of heterogeneous writings, some highly intimate, others profoundly distant, which overwhelms the reader with their arduous insistence and demand for thinking. It is as if Moreiras is repeating the Heideggerian conclusion that we have not even begun to think. And what is there to think about in “times of interregnum”? Firstly, the crucial task that Alberto offers up for thought is what cannot be said: the crisis of the Humanities. Suggesting that we do not posses even the concepts or language with which we could start this process, Moreiras is suspicious of returns to national history and grand (canonical) literature. If this is a crisis of crisis, how do we think about the Humanities within the eye of the storm? What kind of crisis are we bearing witness to? It seems that the Humanities has become sort of a bad word: it is a space where a fundamental interrogation on the state of humanity could have been put into question once, and that today increasingly mirrors only the loss of academic jobs of academics and its contingency. Global capitalism turns a necessity, the cultivation of thought and the letter, into contingency by naturalizing the status quo and refusing to recognize the conflict. Important as it may be to address the contingency of academic work, however, the crisis is profound since what is at its heart is the very crisis of thought and intellectuality. It seems that the brutal acceleration and instrumentalization of life itself has surpassed our capability to rethink it without falling into nostalgia and melancholia and other “solutions” that lead nowhere. I am not suggesting here embracing all too quickly a “happy” form of living without really dwelling into the question of globalization. But does anyone really need the Humanities anymore, if anyone ever really did? Is the university, as a space of hospitality without condition, possible today? Can the Humanities offer once again a thought of/for transformation? How is transformation to be enacted irreducibly to wishful thinking and pure dreaming? Critical thinking stutters here, as it fears its own disappearance. There is no room for cynicism or nihilism, however. And even if there is, we must reject it. The situation is difficult, unbearable. Inviting us to abandon recognition, Moreiras underlines the acknowledgment of finitude; the very possibility of doubt and doubting of decolonial and communist impulses (you may want to revise this last phrase, as it is difficult to figure out what you mean). He is one of the rare thinkers who trace the problem of the temporality of thinking itself. For example, he asserts that our accustomed “tools” fail us today as the exhaustion of modern (political) concepts is beckoning us. Perhaps we are bearing witness to the death of modernity. And yet, Moreiras does not offer to salvage those concepts but instead proposes without proposition a further deconstruction of politics. One must ask then what is left of politics and the political after deconstruction? What is unthinkable after deconstruction? Is deconstruction in need of deconstruction? Is deconstruction possible in the eye of a mass depolitization that the failure of neoliberalism made visible? Infrapolitics, as something that happens, offers itself as the radicalization of deconstruction. It is a labor of difficult passion, of possibilization of the impossible, and a constant search, a desire, for the outside. Moreiras himself is hesitant to affirm if and when such a possibility might open up. Certainly not today when the conditions of possibility of/for thinking in the university of equivalence have closed even the possibility of putting into question the university itself and division of labor. Not even to mention the anti-intellectuality and anti-theoretical turn haunting the Humanities. After all, all is said and done, right? And yet, at the same time, Moreiras does not want to abandon the possibility of a new historicity, a new writing of history irreducible to instrumentalization and to the capture of history for supposedly progressive goals. How to exercise such a demand? I believe that the question is not anymore ‘what is to be done’ but how to think the end of doing and the beginning of thinking. At the heart of his intervention is a thinking of radical democracy, a demand for a freedom of life liberated from the identitarian and hegemonic drives, a demand for other thought and time irreducible to the techno-political machine which captures experience and knowledge into another fetish and concept to be applied. In Moreiras we are distant from destruction, and what is being offered is the very possibility of experiencing freedom anew. This is a similar suggestion to what Sergio Chejfec exercises in his Los incompletos. We are not speaking here of mourning, but of the possibility of confronting the real as unforeseeable, as imperfect and inconclusive past. When we understand that, as Javier Marias reminds us, grace without use is also “la suma de todas las posibilidades no realizadas en nuestras vidas no como destino fallido”. Perhaps only then we will be ready to let freedom appear in its inexhaustibility. This is the task and promise of brave negative engagement for any Hispanist. As to those who find Moreiras undigestible—I cannot enter into a detailed analysis, which I think is nonetheless important to one day carry out, of the number of figures who can’t take Moreiras because they do not know he is available for the taking, or who do know, but choose not to partake. I am referring to those who do not read Moreiras at all, yet who occupy prominent places within the institution of theory. This non-reading is not the result of some accident in which we can say: “Well, nobody can read everyone or everything; that is the nature of knowledge; we are doomed to specialization. One chooses a discipline to a large degree by accident; accidental too, then, are the books one is obliged to read to “keep up,” as well as the texts that even come to one’s attention. Non-Hispanists cannot possibly sift through a tome that is only partially about theory, deconstruction, Marxism, neoliberalism, mourning, and unhappiness, that is, non-Hispanic matters, even if to conclude that it, MI, is undigestible. It is just not in the interest of, for example, Derrideans and Heideggerians to do so, even if they can read Spanish (and many, though not enough, in fact can).” This sort of un-digestion—undigestion as as non-reading—is no accident because the entire institution in which we dwell is oriented in such as fashion that a Spaniard, writing in Spanish or English about theory–the entire hegemonic apparatus of the theoretical humanities is organized in such a manner that this kind of person, one such as Moreiras, is not of interest to, does not work in the interest of, any component of institutional knowledge. MI does not serve theorists proper; they do not have the time. Thus, while such folks may be very good theorists, they are completely complicit with the state of the humanities which they pretend to “deconstruct”; Moreiras is the symptom (which, like many symptoms, such as a twitch, appears to everyone but the body of he or she who has it) of that complicity, which symptom remains un-analyzed because many of those who could analyze it—well, it is not in their interest to do so. In this situation, Moreiras proves undigestible not because potential consumers, namely, those who do not consume Moreiras, do not have the time but, in fact, because they cannot be bothered to make the time. By bête or betisse, of course, Derrida means the automaticity of the human—which automaticity is not merely technical but also animal and spiritual, of the soul—which repeats itself and repeats itself without being able to humanize the repetitions, which is to say, without (the human is without) being able to contain them within a rational, responsive and responsible, hence human framework. The human is not bête, to be sure. Man is not animal; he is not the only stupid one necessarily, the only one who can be stupid (the rest are innocent, like a dog who barks too much: what can you do, a dog is a dog)—this is Derrida’s point, in fact: the human is and is not the bête. For, the experience, sense or intuition of sheer nonsense is impossible without a framework or concept. That each thing be digested as just another stupid thing and another stupid thing, indifferent from all other things, hence undefined, nonsensical, is impossible, since the very concept of bête, disavows the bête, rationalizes it, humanizes it, precisely by grabbing it with both hands, which hands make consumption, thus digestion, conceivable. Stupidity is too stupid to be theorized, for example, to be deconstructed. Thus, we can say, that Derrida himself, like Lacan in the seminar on Joyce, illustrates that the great thinkers—and Derrida and Lacan, with precious exceptions, only address great thinkers—include and disavow a bit of stupidity. That is to say, there is a bit of the bête in every humanist intellectual operation, which therefore is and is not human, responsive and responsible. The bête is the trace of the human, and the means by which the last Derrida affirms stupidity as the name of the opening to thought, politics, activism, ethics, fiction, and so forth, even though stupidity itself is neither good nor bad. MI is the history of Moreiras as bête and as not bête. But—and here comes the undigestible component of Moreiras—Moreiras, given his field, given that he is a Spaniard and a Hispanist, in addition to whatever else he is, does not get to address Hegel; he is not granted that right by the institution that MI addresses to show how brilliant Hegel is—to show that Hegel anticipated everything Marx, Nietzsche, Deleuze, Lacan would later say if you just know how to read right, but that he also contains a little bête there where Hegel did not think, the bête by means of which one can demonstrate—those who have the right to read Hegel right—that Hegel did not think everything right, that his thought is finite, and therefore, that absolute knowledge bears a mark of stupidity: a chocolate stain on the tablecloth, food for thought. The double gesture of affirmation and unraveling that deconstruction and/or psychoanalysis perform on Hegel, and on any number of wonderful thinkers and artists, whose perfection, whose magnificent totality, is tainted by imperfection, and whose taint calls forth thought today, for us—Moreiras and MI cannot make this their project their project. In sum Moreiras, a Spanish whitish guyish individual writing about Spanish things or writing in Spanish about non-Spanish things, cannot subsist writing about Hegel, for that writing is not in anyone’s interest, including Moreiras’s. Thus, Moreiras has to write about scholars who are really stupid as if they were Hegel, as if they could be both critiqued and affirmed. Moreiras, that is, must say what he does not say but that I will say for him, to wit, that the Jameson that he cites and reads so generously, desde luego con todo respeto, the discourses of Jodi Dean, Bosteels, Mignolo, Beverley, and so many others within MI, are stupid—I am not saying the people are stupid; I do not know them well enough to say that: their discourses are stupid, this I do know—and they cannot be affirmed and rescued in any way except by casting them as better than they are, which is to say, as stupid as Hegel is. But you cannot do it, which Moreiras’s previous Exhaustion of Difference showed: you cannot cast the stupid that is in fact fact stupid as smart so as then to say that it is stupid. You cannot deconstruct stupidity. You only end saying the stupid is stupid, which is undigestible to the stupid, and also, fortunately, itself a bit stupid, for it is a tautology. Which, that is, the stupid, MI shows, is stupid for a reason: because it takes all concepts–rhetoric, destruction or deconstruction, Europe, the West, ghost, desire, drive, deferral, death, Dasein as el no sujeto, philosophy, Marx, de Man, Badiou, and so on—and converts them into brands that it, the stupid, can then reject as brands, taking concepts along with it. Either that or it, the stupid, can take the conversion of concept into brand and then, as competitor, critique it. The competitor qua discourse of critique of the concept-turned-brand (turned, that is, by that competitor himself) poses as the alternative to of capitalism or colonialism (which the brand represents). Of course this competition with the concept turned brand that academic politics undertakes has only one name: branding. Academic politics (perhaps politics as such, if politics had an as such; yet that is the point infrapolitics: politics as such is naught) emerges, not as a set of concepts or actions but a choice for this or that brand, as an opportunism, brand against brand. And within that discourse the turning to ideas, concepts, and language emerges as a choice, a “buying in”: the choice not to be political but philosophical, textual, literary, historical. To address concepts or language is the choice, according to politics, to be apolitical, hence not stupid. MI is not stupid, or not stupid enough, and that is perhaps its most objectionable quality, at least for those who find it undigestible. Moreiras tries to make these points politely, in a digestible fashion; he tries to deconstruct his objects. But deconstruction presupposes concepts, and concepts are not at work in the objects to which Moreiras, as a Spaniard writing in English or an American writing in Spanish, is bound. So he does not deconstruct, intentions notwithstanding. He discloses the stupid, which stupidity cannot take its being “called,” as one calls the other in poker. Indigestible finally also is infrapolilitics. For the sake of time, I will illustrate with my own example, stupid like all examples, and not at all like the examples in MI itself. In the film “Fences,” which reproduces almost to the letter August Wilson’s early 1980s play, which takes place in 1957 Pittsburgh, the son says to the father—and both characters are of course black—a father bitter about a denied career in major league baseball, that things have changed: “Dad, the Pirates have this black Puerto Rican player named Clemente!” The father’s response, a father who is blind to himself, blind as all tragic characters are blind, can be heard as an case of identity politics, although identity politics is rarely as eloquent as August Wilson. However, the space of that politics, whatever one thinks about, is not defined or determined by politics. It is defined and determined by the word “black,” which is linguistic not political, for it is a trope. Indeed, no skin color is actually black. The field of the politics is determined by blackness, which blackness is not political but rhetorical. There you have the beginning of an understanding of infrapolitics. First, there must be a claim on politics, a specific claim, like the father makes about the injustice black people face; the claims outlines, forms the boundary, of the domain of politics–politics in the particular, factical circumstance. But the claim itself is not grounded in politics, but in blackness, which is rhetorical, though it could also, in another analysis, be seen as ideological, philosophical, ethical, religious, historical—the point is that is it not political. The claim on politics is impossible without the non-political that grounds the claim. The limit, the boundary, the border, the definition of the space of politics is not given; it happens when you claim it. When you claim politics, and all Hispanism and all theory does for reasons I cannot explain here, you expose the non-politics of politics, the irreducibility of politics to itself, that which is indigestible to any political as such, precisely because it denies the political as such. Now, the son’s comment, “the Pirates have a black Puerto Rican player named Clemente,” pronounced in either 1957 and the early 1980s (depending on how you look at it) is also pronounced in the film, by Denzel Washington, in 2017. And in 2017, Roberto Clemente, were he alive as, say, David Ortiz is alive, would not be a black ballplayer but a Hispanic one. For African-American, the displacement of a biological referent, a skin color, black (which again is not a skin color but a trope), with an historical/cultural definition of a race, a race of people that came to America from Africa as so many slaves, overcame slavery, then overcame incredible injustices through the civil rights movement, and now faces and combats new injustices—AfricanAmerican now overdetermines blackness, though black and AfricanAmerican are, today, equally proper. Thus, only African Americans, in the discourse of baseball, which in “Fences” is the discourse of every discourse, and certainly the discourse of justice, are black, while the Dominicans and Cubans and Panamanians and Venezuelans and Puerto Ricans, and so on, who one might have once called black, as the son calls Clements black, are Hispanic. So the identity politics of baseball regarding race is now defined, at least in part, by the African-American/Hispanic division. Of course, again, the essence of an African-American politics is the definition “African-American”—which, by the way, is not a signifier without signified, a word without definition a la Laclau but definition itself, the determiner of the political space—which is not political; it does not come from politics. The essence of an African-American politics, “African-American,” indeed, is not itself politics but infrapolitical, inscribed into the political as that which is irreducible to it. Now, it ought be clear that any politics concerning race that might emerge in the project of baseball, or any other project, would form at the limit of the political, which is there where African-American and Hispanic meet, which is no place; for there is no place where the division between the two can be grounded. The Hispanic, as other than the African American and other than the white, Native-American, indigenous, is nowhere to be found. Its territory emerges only through the sociologiziation of knowledge and culture: everything with a place in its place. Even if other places bleed into that place, as in mestizaje—that is ok—but, for the sociologization of the knowledge to win out, first there must be a rightful place, so that there can be rightful politics, which is the conquest of place, or property, or concepts turned brands. Politicization is both the exposure and erasure of the infrapolitical, the non-place or non-ground of any definition, in MI, of the Hispanic or Hispanism. And if you start a discourse on Hispanism from a foundation that says that Hispanism is not a place and has no place—well, that is undigestible for Hispanism and non-Hispanism alike. Carlos Casanova’s short book Estética y Producción en Karl Marx (ediciones metales pesados, 2016), a condensed version of his important and much longer doctoral thesis, advances a thorough examination of Marx’s thought, and unambiguously offers new ways for thinking the author of Das Kapital and beyond. Although the title could raise false expectations of yet another volume on ‘Marxism and Aesthetics’, or, more specifically, a hermeneutical reconstruction of a lost ‘aesthetics’ in Marx, these are neither the concerns nor aims of Casanova’s book. Instead, he does not hesitate to claim that there are no aesthetics in Marx’s thought derivative from German theories of romantic idealism, conceptions of the beautiful, or the faculty of judgment in the Kantian theory of the subject and critique. “Vale decir: lo que hay en Marx es un pensamiento del limite, no del fin del humanismo, sino de un pensamiento de lo humano que consiste en un pasaje al límite del humanismo donde este se vera menos suprimido que suspenso, desfondo en su “raíz”. Digamos que, utilizan una expresión de Esposito y de Nancy, lo que hay en el pensamiento de Marx es más bien una “división/interrupción” del mito del humanismo” (Casanova 16). Marx’s ‘aesthetic industry’ crashes the humanist onto-theological machine, which opens the inoperativity of man’s praxis as irreducible to the concrete and abstract extraction of value and production. This displacement pushes Marx away from the humanist machine of universality or particularity as the two poles of a locational dispute of the “subject”. Further, what follows from this claim, are two ways of liberating Marx from the constraints of the Marxist principial tradition and the opposition ‘structuralism vs. the subject’ towards a new use of man’s praxis. In the first part of the book, Casanova takes up the inoperativity of Marx’s humanism (“Humanismo del hombre sin obra”), and in the second section (“Tecnologías de la producción”), the analysis shifts towards a polemical scrutiny of the question of technê against the theorizations of telecratic instrumentality, but also from the phenomenological interpretations that have understood Marx’s thought as the consummation of the epochal technological enframing. Of course, Casanova’s book, and his own reflection on Marx, is situated in the wake of a reconsideration of the technology of the sensible, that allows him to read Marx beyond the humanist onto-theology as a messianic principle that propels the Hegelian philosophy of history as stasis for mastering the logic of revolution. Casanova’s Marx is an-archic or aprincipial in Reiner Schürmann’s sense, as it avoids the substantialization of a ‘marxist politics’ to assert a stable ground for action over thinking. The Marx endowed in Estética y Producción is also an-anarchic in yet another sense: it offers no productive horizon of philosophical knowability as a new vanguard of intelligence, a technology of critique, or even a practice of restitution. Casanova makes no concessions to epochal nihilism, and there is no attempt in crafting Marx as an archē for militant hegemony or the invariant procedure of truth. His intervention is situated at the crossroads between Agamben’s archeology of potentiality, J.L. Nancy’s deconstruction, and more esoterically, a Chilean critical constellation, which includes, although is not limited to Pablo Oyarzun’s Anestética del ready-made (2000), Miguel Valderrama’s La aparición paulatina de la desaparición del arte (2008), Federico Galende’s Modos de Producción (2011), and Willy Thayer’s Tecnologías de la crítica (2010). This list could go on, and although none of these names are directly confronted, it would be interesting to read his intervention as a radical conceptual abandonment of the “aesthetic” in this specific cultural field. “Los órganos humanos son las capacidades desarrolladas, esto es, el poder ser actual de los individuos al igual que los medios o instrumentos a través de los cuales esas mismas facultades se ejercen. Al mismo tiempo, ellos son los productos, el mundo objetivo del trabajo de toda una historia pasada: son los sentidos de una actividad productiva, entendida como “la relación historia real de la naturaleza (el “mundo sensible”) con el hombre. Son, en suma, los órganos de la industria del hombre” (Casanova 31). What capitalism stages in the figure of the proletariat, as a result, is a series of divisions that obfuscate the taking place of a praxis constitutive of the industry of man; that is, of the life of the generic without work. In this intersection, Casanova is very much dependent on the Aristotelian’s definition of man’s essence as an-argos, or without work . Hence, Marx’s “real humanism” entails necessary praxis of the industry of the senses, which capitalist humanism divides and codifies in terms of exploitation, alienation, rule of law, and private property. However, and more importantly for Casanova, is the privatization of the sensible transformed into an aesthetic apparatus that governs over life (Casanova 44-45). The modes of production are in this way already a semblance and reduction of the overflowing of the senses in the praxis of man, which necessarily posits poesis as what cannot amount to work through the unlimited process of accumulation. The labor of the proletarian, understood as the industry of the generic being, enacts an undefined potentiality, in which action and thought, singularity and commonality, sensing and reason, collapse in a heterochronic plane of immanence with no remainder. The becoming of man corresponds to the becoming of the world beyond the principle of equivalence as the structural circuit through which global spatialization of capital replaces the possibility of ‘earth’. Marx’s humanism without work is situated against this ruinous and fallen world confined to the logic of exchange and appropriation. The proletariat stands here less than a subject for and in history, as the site where an excess to productivity and equivalence is latent as a multiplicity of singular potentialities: “Ya no hay nada que apropiar mas que lo inapropiable – el libro uso de común de las fuerzas de producción – de una apropiación no capitalizable, es decir, excesiva respecto del marco económico politico de productividad, por ende no mensurable de acuerdo a la medida del valor, es decir, no gobernable bajo el principio o ley universal de la equivalencialidad” (Casanova 53). To appropriate the inappropriable is the stamp of Marx’s industry of the forms of life as the turn towards what is an excess to equivalence. But Casanova’s Marx as the thinker of the inappropriable cannot escape the function of appropriation in the event of a modality of work, which constitutes, perhaps to the very end, the aporia’s of Marx’s thinking . The function of positive appropriation of force in Marx is still tied to “esta producción multiforme del globo entero” (Schöpfungen der Menschen)” (Casanova 52). Casanova forces Marx to say that a relation always implies the production with its own potentiality. But is not appropriation of production haunted by the unproductivity that is deposed in every praxis? That is, only because praxis is use, there is no longer an appropriation of wealth, which remains on the side of vitalism as a productive entelechy disposable for work. However, Casanova affirms that Marx’s communism was perhaps the first (sic) in taking into account how labor and property are economic categories of policing and subjecting the organization of life. In fact, all subjectivization is already a movement capture of immanence as a regime of equivalence in both the apparatus of modern sovereignty and in the capitalist form of exchange of the commodity. Marx’s communism is thus not a movement that trends towards the transformation of the actual state of things, but a deposition of a self-relation of one’s potentiality. “Un pensamiento de las condiciones denominadas “materiales” de existe es un pensamiento que necesariamente vincula, como cuestión ineludible la deconstrucción de la metafísica de la presencia con la pregunta por la condición material, económica, y social de los hombres. Un pensamiento así es, por otra parte, un pensamiento que se piensa en “la ausencia de presencia como imposibilidad de clausura del sentido o de acabada presentación de un sentido en verdad” (Casanova, 79). Marx’s critique of political economy appears as a translation of his critique of religion as the deconstruction of the onto-theology of capital and the subject as coterminous with the principle of general equivalence. Equivalence is what renders abstract the industry of sense, capturing every singularity in a regimen of equality in exchange value and the commodity form. As such, the technology of capital equivalence is what separates and articulates for “work” the co-constitutive modal ontology of originary technê. More importantly, the originary technê allows for the emergence of politics in Marx that Casanova does not shy away to call “politics of presence” (política de la presencia) as the force that un-works the labour apparatus of labour. But, even in its appropriative force, is not production what thrusts the ‘absolute movement’ towards non-work? Casanova is aware of this aporia when at the very end of his book he asks: “¿Continúan siendo las fuerzas en este movimiento metamórfico, fuerzas dispuestas dentro del marco de la productividad? ¿Siguen siendo las fuerzas del hombre fuerza de trabajo, o más bien, se transforman en fuerzas humanas en cuanto tales…” (Casanova, 118)? Could the limit of Marx’s thought be inscribed in the way in which concrete industriousness in the essence of man, only dispenses what is proper and productive in the anthropogenic event? Why is the status of “force” in the becoming of the sensible of the singular? At the very end of the seminar Heidegger: The Question of Being and History (U Chicago, 2016), Jacques Derrida posits the existential analytic as what precedes anthropogenic event based on labor and its force of the negative . But this is only the Hegelian telling of the ‘story’. Casanova grapples to make Marx a thinker of the originary technê in a metamorphic movement that brings to a zone of indistinction thought and action, whose appropriation is always that of the excess of the proper. Could this entail that communism in Marx rejects the notion of “equipementality” (verlässlichkeit) for a program of emancipation in the movement of appropriation of work? If so, then the labor of stasis at the heart of the sensible industry fails at being formalized into a ‘politics of presence’. What opens up is an infra-political relation, a necessary fissure within any articulation of the common in the event of appropriation. In repositioning Marx to the improper site of desouvrament and the ungovernable, Casanova stops short of offering a Marxist ‘politics’. But perhaps no such thing is needed: the task of freedom is to abandon any metaphoricity as a new nomos of the senses. Bresson captured this freedom in a remark on Cezanne: “Equality of all things. Cezanne painted with the same eye, a fruit dish, his son, and Mt. Sainte-Victoroire” . The ‘grandeur of Marx’ resides in that the sensible machine is never ontology of art; in the same way that hegemony never constitutes a phenomenology of the political. At the heart of Marx’s industry there lays, always and necessarily, a life without “work”, something other than politics. 1. This pertains to the passage from Aristotle’s Nicomachean Ethics (1098 a7) in which the philosopher argues that the musician has a particular function that defines his work, but the human to the extent that he is human, is born without work. 2. This is what Agamben detects in Use of Bodies (Stanford University, 2016), as the insufficiency of Marx’s oeuvre in terms of the fixity to the modes of production: “One-sidedly focused on the analysis of forms of production, Marx neglected the analysis of the forms of inoperativity, and this lack is certainly at the bottom of some of the aporias of his thought, in particular as concerns the definition of human activity in the classless society. From this perspective, a phenomenology of forms of life and of inoperativity that proceeded in step with an analysis of the corresponding forms of production would be essential. In inoperativity, the classless society is already present in capitalist society, just as, according to Benjamin, shards of messianic time are present in history in possibly infamous and risible forms.” 94. 3. Jacques Derrida. Heidegger: The Question of Being & History (U Chicago, 2016), p.194-96. 4. Robert Bresson. Notes On The Cinematographer. New York: NYRB, 2016. Sergio Villalobos-Ruminott’s Heterografías de la violencia: historia nihilismo destrucción (La Cebra, 2016) is, at first sight, an assorted compilation of fifteen programmatic essays. Mostly written during the last decade or so, these texts attend to a wide range of theoretical specificities, such as the baroque and performative violence, imperial reason and contemporary literature, sovereign-exception law and flexible capitalist accumulation. It is to Villalobos’ merit that none of these issues are restituted to academic knowledge production or leveled out as a selection of “hot topics” within the neoliberal marketplace. As in his prior Soberanías en suspenso: imaginación y violencia en América Latina (La Cebra, 2013), what is at stake, far from erecting the edifice of a ‘critical theory’ aspiring to fix the limits of reflection – as postulated in “sovereignty” “nihilism” or “destruction” – is the composition of a constellation that circumnavigates the vortex of the general horizon of the philosophy of history and the university machine. In some way, Heterografías is auxiliary to Soberanías en suspenso, but not in the parasitical sense of amending or filling previous generalities. This new collection pushes thought beyond the specificity of the insular ‘Chilean scene’, providing for the indeterminacy of the logic of sovereignty as the arcanum of both interruption and continuity of the philosophy of the history of capital in Latin America. This is not to say that in Soberanías en suspenso the ‘local Chilean scene’ operated self-referentially as the archive for the reassertion of a cultural investigation. In the prior book, the Chilean scene is understood as a paradigm, in the sense of a singular relation to the singular, which Heterografías converts into a topical ensemble that interrogates the displacements, variations, and narratives of principial Latinamericanist reason from both nomic and anomic spatial formations. Heterografías resists positing a new metaphorization of history, as well as yet another ‘political theory’ for what Latinamericanists identify as the object of “Latin America”. Although Villalobos does not thematize it as such, his book is full-fleshed post-Latinamericanist, and the reason is not just because it moves and weaves through the Schmitt-Kojeve debate on geopolitics and colonialism to the politics of the baroque and Catholic imperial katechon; from Latin American literature (Borges, Lamborghini, Perlongher) to debates on memory and indexing (Richard, Didi-Huberman, Segato). It is post-latinamericanist because it challenges the university praxis that administers, organizes, and provides for a linguistic transculturation to a post-katechontic ground that is today insufficient except as onto-theology and reproduction of cliché. “…no se trata de elaborar una ‘mejor crítica’ de lo real ni de desenmascarar el carácter ideológico de un programa en competencia, sino de debilitar la misma lógica “fundamental” que estructura el discurso moderno universitario…. desistir del nihilismo en nombre de un pensamiento que no puede ser reducido a un principio hegemónico de producción de verdad y de saber. La post-hegemonía de la que estamos hablando, no es solo una teoría regional destinada a evidenciar los presupuestos de la teoría política contemporánea, sino también la posibilidad de establecer una relación no hegemónica entre pensamiento y realidad. Ubicarnos en esa posibilidad es abandonar el discurso de la crítica de la denuncia y particular de una práctica de pensamiento advertida de las fisuras y trizaduras que arruinan a la hegemonía como principio articulador del sentido y del mundo” (Villalobos 36). What is offered to radical “destruction” is the principle of sovereignty that, as Villalobos painstakingly labors to display, is always already an-archic and in–determined. If according to Reiner Schürmann, the principle (archē) is what structures and accounts for the ground of presencing in any given epochality; Villalobos bears witness to the an-archic instance of every form of apparatus (literature, geopolitics, the national-popular, ethnicity, war, neoliberalism, etc.) that seeks to ground itself through principial formation, as both origin and commandment. In this way, the ‘history of metaphysics’ is not taken here as a teleo-phenomenological compression reducible to the very hyperbolic presencing of mere principles, but as a folding process that transforms the critique of metaphysics to that of its apparatuses. This has radically consequences, since it is no longer a debate about the university regime of knowledge production, or about the co-belonging between the destruction of metaphysics and the metaphysics of destruction, but rather: “…como concebir el carácter moderna y prosaico de las prácticas históricas, ya no investidas con un secreto transcendental, sino que constituidas como aperiódica radical de de-sujeción” (Villalobos 136). The gesture does not wish to open a second order of exteriority to thought (whether geopolitically or subject-oriented), but a practice of the “non-subject” within the interregnum that lends itself to the radical historicity beyond the historicism of its apparatuses. The interregnum highlights the radical dislocation between philosophy and history, disinhibiting the categorial determinations that attest to its in-determinacy (Villalobos 145). By putting emphasis on the indeterminate character of violence, Villalobos is also indicating the flexibility and modality of effective law in every specific historical instance . Thus, to amend the anomic status of the interregnum is always already to fall a step forward into nihilism and its epochal structuration of the given conditions. This is the instinct of all hegemonic principial incorporation as a pastoral or geopolitical formation. Heterografías consistently points to the folds that open to a potential constellation of singulars as an otherwise of experience de-contained from the duopoly philosophy-history and the cunning of capital (Kraniauskas). As such, Heterografías advances the destruction of three transversal lines that feed the apparatuses of the philosophy of the history of capital in the interregnum: sovereignty, war, and accumulation. It is not the case that these lines have their own autonomy, historical foundation, or even ‘substance’. Rather, these folds that act as an assemble that partition and make up what I am willing to call the Latinamericanist exception in its metamorphosized transformations that aggregate knowledge, practices, and discourses. To dwell otherwise on the interregnum entails precisely to ‘free the lines’, as Deleuze & Guattari’s proposed in A Thousand Plateaus, crisscrossing the modalities of war (in times of peace or what Villalobos calls pax Americana); sovereignty (as still rendered in the katechontic determination of the State and fictive ethnicity); and accumulation (as an always ‘ongoing appropriation and expropriation’ from modernization processes to neoliberalist dispossession). “Faltaría pensar la no-relación entre el ni-amigo-ni-enemigo, lo neutro blanchotiano, que se des-inscribe del horizonte sacrificial de la tradición política occidental, esto es, de una cierta tradición política asociada con el principio de razón, con la comunidad y la amistad, como decía Derrida, o del sujeto, como dice Alberto Moreiras, apuntando a una dimisión no afiliativa ni fraternal, no principial ni fundacional, sino infrapolítica” (Villalobos 92). Infrapolitical relation is given as a promise that retains freedom of life during the time of the interregnum against all apparatuses of capture and conversion (it is no by accident that the marrano figure appears a few times through the book in decisive ways). How can one participate in conflict without necessarily open to war? How could one instantiate exchange without reproducing the principle of equivalence? How could there be a relation between literature and politics beyond representation and the productionist aesthetic institution and the literary canon? The potential to render thought otherwise, profanes every articulation of the apparatus allowing for a political exigency in the interregnum: an infra-political relation with the political, which brings back democracy to its post-hegemonic site. It is in this sense that Heterografías it is not a book disconnected from the “political practices” or what the althusserians call the material “conjuncture”. On the contrary, the task is achieved through a reflexive gesture that attends to every singular determination of the ‘ongoing accumulation’ that exceed the libidinal and memorialist investments in Marxian locational archives . The purpose is to avoid a calculable relation with the conjuncture as always already shorthanded for hegemony, will to power, ‘movement of movements’, subjection, etc. ; as to de-capture the radical historicity no longer ingrained in History’s metaphoricity. This is why Borges, the a-metaphorical thinker, disseminates Heterografías at various key moments juxtaposing politics and imagination and undoing the master-theory for political movements that always speak in the name of ’emancipation’. (The fall of Brodie in Borges’ short-story is the absolute comic negation of the Pauline’s militant conversion at Antioch). As already specified in Soberanías, the threshold of imagination becomes the task for intra-epochal (interregnum) experience. Imagination, of course, does not point to an anthropological faculty of humanity, the prevalence of a sensible component over reason as in Kant, or a new intellect that as post-universitarian is able to secure a new site for prestige. Imagination is a preparatory relay for a turbulent de-formation of the apparatuses in to a common universality of singulars. Villalobos does not deliver a general theory of imagination, since imagination is already what we do as a form of dwelling, in the course of every form of life. I would like to un-translate Heterografías in these terms not because imagination remains the unsaid in every practice of destitution as what always escapes identity, equivalency, or the friend-enemy relation. But then, is imagination the outside of nihilism? “En última instancia, se trata de pensar los límites históricos de la imaginación política latinoamericana, misma que necesita trascender la nostálgica identificación con una política reivindicativa y radicalizar su vocación popular en una suerte de populismo salvaje, que no se orienta heliotrópicamente a la conquista del poder del Estado, para una vez allí, disciplinar a las masas. Un populismo sin Pueblo, pero con muchos pueblos, heterogéneos y contradictorios, con una énfasis insobornable en los antagonismos y no en las alianzas, en las figuraciones catacréticas y disyuntivas…En suma, un populismo post-hegemonico…” (Villalobos 228). The political mediation insofar as it is post-hegemonic ceases to dominate in the principial totality where life and the social, as based on fictive identity, coincide or collapse unto each other. This post-hegemonic populism cannot be said to be one at odds with institutions, or merely just cultural or charismatic supplement. Villalobos seems to be opening here the question of a distinctive form of law that would require imagination, not heterographic violence; attentiveness to singularity, and not another politics of the subject. How could one think a law that exceeds the citizen and the exception? Is it not isonomy – as the principle of the integral movement towards citizenship – what hinders and captures political life over its heterographic excess? Could one imagine a law that is consistent with democracy as the self-rule of a minor people, of a people without history, a savage people, inhabiting the true state of exception? The answers to these questions are not to be found in Heterografías de la violencia. Villalobos-Ruminott has made a striking effort to sketch a set of common objectives, tasks, nuances, exigencies, and considerations for the possibility of critical thought (in the deleuzian sense) against the grain of interregnum’s anomie. The task is immense, even when its transparent language is deceiving: to open a fissure of worldliness (mundanidad) in preparation for a savage democracy to come; enabling the conditions for a way of thinking that is not oblivious to the production of violence within the ongoing accumulation that unfolds and whitewashes the present. Alberto Moreiras. “Poshegemonía, o más allá del principio del placer“. Poshegemonía: el final de un paradigma de la filosofía política en América Latina. Madrid: Biblioteca Nueva, 2015. It is in the quasi-concept ‘effective operation of law’, where Villalobos comes nearest to Yan Thomas’ studies on the juridical flexibility of law. See his Les opérations du droit (EHESS, 2011). I am thinking here of Veronica Gago’s recent book La razón neoliberal: economías barrocas y pragmatica popular (Tinta Limón, 2015) which seeks to render a micropolitical form of neoliberalism from below deploying the concept of ‘baroque’ to ‘express’ its emancipatory and empowering dynamic in the informal sector. For Villalobos, on the contrary, informal economy is not an exception to the visible form of accumulation, but its flexible difference in the age of an-archic capital. The baroque is not a given instance for “emancipation” or “subjective agency”, but where sovereignty becomes dramatized in its most extreme degree: “Es decir, necesitamos pensar el barroco como una problematización de la filosofia de la historia del capital, con una interrupción que trastoca la especialización del atemporalidad propia de la metafísica moderna y más específicamente, de su correlato, política, la versión liberal-contractualista del orden y del progreso social” (78). “Diría que hay, al menos, dos formas de confrontar este problema; por un lado, la posibilidad de repensar el marxismo, Marx y sus diversas apropiaciones, según su historia, sus filologías y tradiciones, para determinar la “verdadera” imagen de Marx, hacerle justicia a su corpus, exonerarlo de los excesos de la tradición y traerlo al presente según una nueva actualidad. Por otro lado, sin renunciar a un horizonte materialista y aleatorio, la posibilidad de elaborar una crítica de la acumulación….” (215). Giorgio Agamben. “In nome di che?” Il fuoco e il racconto. Rome: nottetempo, 2014. In the last chapter of Heterogeneity of Being: On Octavio Paz’s Poetics of Similitude (UPA, 2015), Marco Dorfsman tells of how he once encountered a urinal in the middle of a library hallway. It was a urinal possibly waiting to be replaced or already re-moved from a public bathroom. The details did not matter as it recalled the origin of the work of art, and of course Duchamp’s famous readymade, originally lost only to be replicated for galleries and mass spectatorship consumption. Duchamp’s urinal, or for that matter any manufactured ‘displaced thing’ reveals the essence of technology, at the same time that it profanes its use well beyond appropriation and instrumentalization. I recall this late anecdote in the book, since Dorfsman’s strategy in taking up Octavio Paz’s poetics is analogous to the dis-placing of a urinal. In Heterogeneity of Being, Paz is de-grounded from the regional and linguistic archive, dis-located from the heritage and duty of national politics, and transported to a preliminary field where the aporetic relation between thought and poem co-belong without restituting the order of the Latianermicanist reason. Heterogeneity of Being is Dorfsman’s leap (a versuch that gathers also the innate ability for failure in the Nietzschean sense) to cross the abyss of the poetic identity; fleeing from the national-popular frame, as well as from the pitiable origins that enable every ground of transcultural articulation. Against the good intended “–abilities” to “speak on the name of” and in the “place of” the other, Dorfsman offers an exercise in thought. The initial hypothesis is how to assimilate, or render thinkable, an ontology of Pazian poetics in the way of a ‘stimmung’ facilitating the endeavor for thought (12). Heterogeneity of being is nothing more than this, but it happens to be also a stroll around Paz’s poetical constellation– not without accidental turns, missed encounters with transient signatures, interrupted articulations and rhythms – as an attempt to arrest the fold between thinking and the poematic. The poematic is understood here as a strange habitation of sorts; a stanza for the (im)possibilities of thought. Indeed, the poematic is that which allows a tropology that exceeds the compartmental and sheltered demands of the political, subjective, and ethical drives. Against the temptation of disciplinary binds (which are, after all, signs of university semblance), Dorfsman calls for an incomplete Paz that cannot be an objectified signatory authority, but rather as what unveils the temporality of being (11). Pazian poetics co-belong with the existential time, since it is a now time (the time of a life), which appears at the gates, without entry, of the culturalist and conventional literary methodologies responsible for the organization of poesis legistlation. Dorfsman is not interested in what we could call a “signatory local scene” of the poetic (“Paz in Mexico” or “Mexico un Paz” – the usual postal-service that is always the currency of exchange) as if the “poem”, as the poet’s standing reserve, could supplement what remains on the side of the unthought or the repressed. (Say an ancient cosmogony, a non-Western mantra, or a temporality that derails the homogeneous or messianic time of the modern). Rather, “Paz” is depository of a heterogeneity of inheritance that fails to assume the form of an identity, a destinial time, and therefore is always “anachronistic and it involves a ghost, a specter” (Dorfsman 18-19). Laberinto de la Soledad, Postdata, or ¿Águila o sol? attentively read in the initial chapters of the book are displaced from the topical discussion of ‘Mexican identity’ to one of difference and inheritance, or as Dorfsman’s conceptualizes it, of “dif-herencia”, following Derrida’s elaboration of spectrality and heritage in Hamlet-Marx. The temporalization of the poematic allows Dorfsman to unveil in Paz’s thought as a language of dif-herencia that: “is not a concept or a metaphor; it is more like a simile or a pun. It thrives on its ambiguity and imprecision” (23). Dif-herencia brings to halt the logic of identity and difference, while attending to the exposure of a wound (herida) internal to the process of deappropriation and splitting. Thus, more than drift towards a criollo fictive ethnicity, Paz is reservoir of specters that punctuate through a politico-ethical relation that bring forth responsibility and the practice of witnessing emptying identity formations. Pazian poetic time, suggests Dorfsman, does not inaugurate something like a “national I” or a “principial Mexican inheritance of the letter”, but a dwelling that opens a singular existence and disavows every nomic allowance. Pazian poematicity is an atopic temporal relation with a groundless tradition. “…the revolution, perhaps the most authentic because it set up a confrontation with the interior nothingness of being, only managed to produce a new mask, an institutional mask, the PRI, whose transfigurations and unmasking continue to this day. The chain of identities, Spanish, Indian, Mestizo, Catholic, liberal,….etc, can all be inherited and disavowed, they are all interchangeable and all empty” (47-48). The poematic in Paz is in the order of the profane, although not because it dwells in the radical historicity of the singular seeking to ‘represent’ or ‘donate’ the real world with measured political action, but because it has no desire in instantiating a historical event (or a new politics). The profanity of the mask vis-à-vis the logic of similitude is a space of potential use that trans-figures the other for becoming. It is a style that is both singular and disjointed. In Dorfsman’s propositional hermeneutics, Paz’s discussion of identity is only preparatory for a de-identification of a singular-plural that destitutes every politics of location, and in fact, all politics of being within history. Pazian culturalism is dissolved not only in similitude / simulation, but also in the poetic temporality of language. Here, similitude coincides with the event of language itself, making the poetic the very singularity of profanation. In Piedra de sol, Dorfsman reads the verse “unánime presencia en oleaje” in light of Heidegger’s poetological exegesis of Parmenides poem and the poetic universe of Georg Trakl (94-96). But Dorfsman goes further, since for him the Pazian poematic bear witness to the rhythm of singular life (I would also argue of the ‘immanent cause’, although this is not explicitly in the analysis) where the way of language builds its own path or “camino”. Hence, it is no longer a subject that enacts or wills, but the time of being which against the order of signification, stems from the stasis of language (“en el seno del lenguaje hay una guerra civil sin cuartel”) (97). Crossing tracks with Heidegger and Trakl, Dorfsman’s disobeys the exegetical command of the Pazian archive, only to re-direct it to the spiral of errancy of language. This is the proper region of the poetic temporality or the silence or the simulation in the poem. “To say no the world is to flee, to escape, perhaps towards an elsewhere: poetry. At least towards a certain kind of poetry, the kind of hermetic, escapist aestheticism which Paz seems to be attacking but which, paradoxically, he was himself accused of writing. But no, what the poem here says is not no or yes; it a refusal of both. Is it a negation, then? Rather, it is the recognizing of the aporetic status of the world, to which affirmation and negation are irrelevant. The poet hears a call to either affirm or deny, but he cannot place the call.” (109). It is here, however, where the poematic becomes a problem for thought, as well as an impersonal exigency. This is why it is odd that Dorfsman vacillates in calling Paz’s poetics “mysticism” as temporalizing of language, since it is the mystic reverse what allows for the tracking of silence, for the breathing in of a permanent wound that is its second voice. This is the silent voice that dwells in the event of the calling of thinking, which turns (and the turn here is not just in passing, but indicative of the taking place of language) any iteration of everything unsaid in the event of language . The exodus of the poematic does not lead to the desert but to the nocturnal and illegible knowledge of the pyramid. The pyramid knowledge knows no disclosure. This is where Duchamp’s readymade crosses path with Heidegger’s thought on the essence of technology. This very encounter is pyramidal (or at least triangular: Duchamp-Heidegger-Thing), even if Dorfsman does not attempt the elaboration and keeps it secret. But Dorfsman’s suggests that Duchamp’s painting as philosophy is what speaks (in silence) to the unveiling of modern technology. The duchampian injunction poses another tactical movement: it radically suspends the modern closure on aesthetics (aisthesis), which entails the ruin of the technology of “critique” (Thayer) for the production of ‘visibility’, of the ‘made visible’. It is only in Duchamp where the Heideggerian maxim “the painting spoke”, earns something like a covert instance of life; or in Dorfsman’s terminology, a poetic similitude. The notion of the poem itself becomes profane simulation of every distance relative between language and world. It through this transfiguration of the power of the dichtung (still a revelatory substitution in the later Heidegger) to the readymade, that a heterogeneity of being ceases to be supplementary to the order of history and of epochal destiny. And it is at this instant where the poematic touches and falls into the strange welcoming site “where literature, paintings, shoes, and urinals may speak, but their secretions may be otherwise than meaning” (124). This is no longer a region for aesthetics or production, but desistance in language. Perhaps at this point one could say that the poem has conducted an exodus from itself into the inner sense of silence. Emanuele Coccia. Sensible Life: a micro-ontology of the image. Fordham University Press, 2016. For a take on desistance in the specific context of the Chilean Avant-Garde and the readymade, see Villalobos-Ruminott’s “Modernismo y desistencia. Formas de leer la neo-vanguardia. Archivos de Filosofia, N.6-7, 2011-2012. Giorgio Agamben. “Il silenzio del linguaggio”. Arsenale Editrice, 1983. A friend (someone who is by no means simply trying to dismiss our work by misrepresenting it in order to declare its insufficiency, someone who is aware of the work that happens explicitly under the term infrapolitics) objects that every time the word infrapolitics is used we might as well substitute it for deconstruction. There is the perception that the insistence on the word infrapolitics is problematic, that something has gone wrong. The wrong turn concerns politics. The objection: once we have deconstructed subjectivity, collectivity, history, and so on, we are no longer dealing with a traditional notion of politics and therefore it might be more of a provocation to call the result “politics.” “Politics,” then, understood as the task of deconstruction (assumed to be the proper but denegated name of infrapolitics), is “the work toward and from the other without ground.” So far the objection. I find this reaction needs to be made explicit and taken into account if one is interested in considering the existence of the Infrapolitical Deconstruction Collective. It illuminates, inadvertently, to what extent infrapolitics is no longer a continuation of previous theoretical work. It also highlights to what extent the project makes even those in close proximity a little uncomfortable. My aim with these remarks, then, is not necessarily to say anything new, but to make explicit a facet of our project that has been underthematized. Our friends’ objections shed light on some of the more general protestations (sometimes but not always hostile) being made against infrapolitics at the moment. For it is the very refusal to look politics head-on that is at issue. The accusation of a-politicity is made exactly when politics is being questioned most radically. This is important to note if only as a heads-up against any possible question-begging reclamations. The demand for the useful and effective politicity of infrapolitics is possible only by begging infrapolitics to accept presuppositions that are not its own, by begging infrapolitics to destroy itself. That this can happen both in the name of academic discourse and also in the name of political Causes is testament to the non-place that infrapolitics “occupies” at the moment. Steve Buttes recent comments on infrapolitics highlight the extent to which the project can be mistaken as the latest incarnation of a decades long attempt to do theoretical work within Latinamericanism. Following the gesture of John Beverley in Latinamericanism After 9/11, Buttes treats the entirety of Alberto Moreiras’ work, as well as that of scholars associated with him (Patrick Dove, Kate Jenckes, Marco Dorfman), as different instances of a master project geared toward making certain phenomena visible for the fields of Latinamericanism or Political Theory. Everything “theoretical,” regardless of specific circumstance, becomes the work of “the infrapolitical thinker.” This is problematic on more than one front. For one, it fails to see the specific circumstances that led to the emergence of the term. One of the issues at stake, however, concerns the very image of the moment that animates the work on infrapolitics. To put it bluntly: infrapolitics becomes necessary as a project when the theoretical apparatus that informed much of the work that was done in the 1990s and 2000s seems insufficient, or, more radically, when it begins to serve, in many instances, as alibi in maintaining the staus quo regarding the life of an academic discipline like Latinamericanism. It is certainly possible to quote Lacan or Lacanians in order to show how the subject is constitutively divided from itself, but if this is done in the name of producing more readings or contributions to the study of Latin America, then the radical unworking of subjectivity simply serves to prolong the appearance that everything is just fine so far as area studies is concerned. At the same time, this kind of theoretical resourcefulness hides the fact that it is now necessary for “theory” to begin to do theoretical work of its own beyond the masterful reproduction of what is elaborated elsewhere. And this is not simply a question of arrogantly asserting superiority over any archive, but rather of a recognition that, whatever the limitations of our work, it has to begin to push the boundaries imposed by all images of the present that are handed to us regardless of theoretical provenance. (So we are faced with a group of scholars from disparate backgrounds—cultural and literary critics, philosophers, political theorists, etc.—all of whom are faced with the fact that, whatever their credentials, it seems unavoidable to cross into “foreign” disciplinary territory: we lack the paper work that would make us “proper subjects” in those other territories. One way of putting it would be to consider the existence of a trained Hispanist intent on thinking through contemporary global politics by way of a post-deconstructionist notion of the ontological difference.) In a word: it involves acknowledging, and accepting the consequences on our part, that no one is ever recognized as prophet in his own home—which is fine by us, as we deny the possibility of prophesy in the first place, above all when it comes to knowledge of history and politics. For these reasons, the work of the group does not find a ready-made mode of inscription in stable academic frameworks. That resistance to infrapolitics is felt from within (what the “outside” world considers to be just the usual suspects of poststructuralist theory) as well as from without is indication that the claim that infrapolitics simply continues decades long work by a recognizable sector of any field is not quite accurate. One would first need to account for the fact that thinkers who see themselves as deconstructionists (of whatever ilk) find it necessary to situate themselves at a distance (however proximate) from the project as such. This is simply a fact of our situation, not something that has been posited by us. This distance also marks a certain contour of our current situation, and it is not a minor one in my estimation. It would be impossible to do justice to the diversity of approaches that make up the group by pointing to labels such as deconstruction, theory, hermeneutics, posmodernity, subaltern studies, Marxism, pasychoanalysis, political philosophy, and so forth. The line that cuts across all of those terms has a theoretical bent, but it is far from homogeneous and recognizable from the point of view of the current “tool box” approach to academic positionality. But also, and perhaps more important, what is crucial in each one of those cases is that all of those terms are being constantly divided from within: we are heretical in all our theoretical preoccupations. In my own specific case, I have found it perplexing that some label me as a Heideggerian, a Badouian, a Lacanian, and even an old-fashioned literary critic. At the same time historians claim that history is lacking, while literary critics quip that there is too much history keeping me away from the texts. While I can see why that happens, it always results in a reduction that does little justice to what is actually at hand. And more often than not, these acts of labeling go hand in hand with fundamental objections based on the idea that if I am taking Heidegger, or Lacan, or Badiou seriously enough then I should not be doing what I do. These are not simply personal anecdotes regarding my history in the academy: they indicate a fundamental uneasiness when it comes to a certain kind of work that is being done today (not just by me) that refuses the full capture of academic discourse. Why demand a clear demarcation between deconstruction and infrapolitics? It might be counterproductive to take the path of delineating to what extent infrapolitics is not deconstruction. Derrida, Heidegger, Nancy, and others, are fundamental references for many of us. Thus, it is not out of a need for demarcation but out of a need for a more amalgamated existential specificity (an infrathin [inframince] relation to use Duchamp’s term recently invoked by Nancy, 14) that it has become necessary to insist on infrapolitical and poshegemonic reflexion. For Moreiras, the posthegemonic supplement of infrapolitics “es rehusarse al poder del conflicto central a favor de las múltiples intensidades existenciales de una vida, la común y corriente, la nuestra en cada caso, y de hacerlo además en nombre de la resistencia a toda captura” (Moreiras “Comments to Sergio Villalobos Ruminott’s “Literatura y lucha de classes””). It is not simply that the great categories of politics have to be deconstructed, it is also that the shift toward politics (however “deconstructed”) is a shift toward the obliteration of everyday ordinary life to the extent that it does not show itself useful for the politics of the deconstructed community, or subject. To this Moreiras counters: “La pregunta que siempre se plantea en relación con la infrapolítica, es decir, para qué sirve eso, de dónde la necesidad del prefijo, podría invertirse: la política es en cada caso la captura capitalizante de la vida infrapolítica. Y esa es la definición de política que decide también por qué esa palabra debe caer bajo sospecha, y no sólo en general, sino siempre en cada caso, a cada uso” (Moreiras “Comments to Sergio Villalobos Ruminott’s “Literatura y lucha de classes””). Every time the suffering of the world is invoked as the authorizing instance of academic research, as Sergio Villalobos-Ruminott points out, what is at work in fact is the deactivation, not to say the censorship or annihilation, of this existential or lived infrapolitical dimension. He is referring to the objection voiced in the name of “communism,” but we could substitute the specific terms for politics to the same effect: “la tarea distintiva de la infrapolítica pasa por suspender esos automatismos y poner en suspenso las homologaciones empáticas. Advertida ya de la condición contraproducente de la empatía, la infrapolítica no sabe, pero sospecha de las grandes declaraciones y de las formas monolíticas e identitarias del discurso. Y por eso, más que la restitución de la [política] como motor de la historia, la pregunta infrapolítica sospecha de la [política] como forma histórica de la tesis del conflicto central, misma que estructura el horizonte onto-teológico occidental. Desde esta inquietud, la lucha de clases en sus formulaciones más militantes y sentidas no repara suficientemente en su función catecóntica, función que le permite amortiguar, neutralizando, la intensidad discontinua de las múltiples luchas sociales.” Which is to say that the problem of infrapolitics is not simply to offer a resignification of politics, a better sense of the political, but to show how the invocation of politics is always the erasure of the infrathin existence that does not allow itself to be captured by the political in any form. Buttes, Steve. “More Thoughts on Infrapolitics”. https://infrapolitica.wordpress.com/2016/05/02/more-thoughts-on-infrapolitics-steve-buttes/, 2016. 3 May 2016. ____. “Some Questions for Infrapolitics”. https://infrapolitica.wordpress.com/2016/04/10/some-questions-for-infrapolitics-by-stephen-buttes/, 2016. 3 May 2016. Moreiras, Alberto. “Comments on Regional Critical Work”. Infrapolitical Deconstruction: Discussion Group, 2016. Facebook. 29 April 2016. <https://www.facebook.com/groups/446019398878033/permalink/875947335885235/&gt;. ____. “Comments to Sergio Villalobos Ruminott’s “Literatura y lucha de classes””. https://infrapolitica.wordpress.com/2016/05/02/literatura-y-lucha-de-clases-comunismo-del-hombre-solo-de-fedor-galende-vina-del-mar-catalogo-2016/ – comments, 2016. 2 May 2016. Nancy, Jean-Luc. Intoxication. Trans. Phillip Armstrong. New York: Fordham University Press, 2016. Print. Villalobos-Ruminott, Sergio. “Literatura y lucha de clases. Comunismo del hombre solo de Fedor Galende (Viña del Mar: Catálogo, 2016)”. https://infrapolitica.wordpress.com/2016/05/02/literatura-y-lucha-de-clases-comunismo-del-hombre-solo-de-fedor-galende-vina-del-mar-catalogo-2016/ – comments, 2016. 3 May 2016. For Moreiras, the continuity with the work on Latinamericanism, which was always a problematic relation to begin with, is now untenable. Recently he has offered the following exposition of the problem: “there is a void at the place where critical regionalism used to exist as Latinamericanism. Today the position is empty, and our mission … is to work back from that empty critical position into a proper genealogy of historical life: in other words, history is all we have, or history + the void. For me also, this has been developing essentially since the end of the Cold War, but more markedly and more catastrophically since 9/11, 2001—an event that marked the end of postcolonial thought as a genuinely productive possibility. We can note that, today, even people that are enthusiastic about the Latin American progressive politics cycle do not talk about it in terms of any kind of critical regionalism, rather in terms of whether or not the left can become hegemonic, and what mistakes are being made strictly following a political and economic logic given actual conditions, where ‘culture’ is very often simply another fact of political economy. Simply put, from my perspective, geopolitics has shifted to such an extent Latinamericanism, and any kind of great-spaces area studies, have lost their function today. This is a crisis in university discourse because the disciplinary constitution of the university has no replacement for that function but also or primarily because the disciplinary constitution of the university also has no interest in developing it. So we do a genealogy of historical life–perhaps looking for some kind of impersonal democratization as critical horizon, and perhaps looking for singularities of the time of life, what we used to call a ‘metahistory of material practices of power.’ Such is what remains of a Latinamericanism that can no longer sustain an intellectual endeavor in my opinion. My point, once again, is not to be pessimistic, but precisely to avoid all pessimism through an eyeball-to-eyeball confrontation with the state of things as they are. Only a clear understanding of the epochal situation can help orient our own careers, what is a dead end, what is not, what the function of intellectuality connected to languages and historical traditions could be today. My opinion: we owe tradition nothing, but we may want to establish a relationship to it, that is all. How we do it will define our role for the foreseeable future. Finally, I defined myself as a Latinamericanist only to the extent I have an ongoing conversation with Latin American intellectuals, and in no other sense. Same as regards Hispanism” (Moreiras “Comments of Regional Critical Work”). Something radically other is at stake here, or so we wish to propose. To the extent that something is ‘actual’ is so because it allows conditions for thinking and thought; that is, conditions of doing in thought. Then, of course, there are activities and activities. As Lyotard observed, there are some activities that do not really transform anything, since ‘to do’ is no a simple operation (Lyotard 111). So much is needed for this encounter to happen – and the purpose of this encounter with many friends here is Línea de sombra ten years after. This was Alberto’s fourth major book – after Interpretacion y diferencia (1992), Tercer espacio (1999), and The Exhaustion of Difference (2001), and that is without counting his early La escritura política de José Hierro (1987). Línea, we should not forget it, was published in Chile in 2006, under turbulent circumstances. We are referring here of course to Alberto’s exodus to Aberdeen, and in a way his “exile” from the enterprise of Latinamericanism. The drift to suspend the categorial structure of the Latinamericanist reflection was already underway in Tercer espacio and Exhaustion, books that radically altered the total sum of reflections on and about Latin America, in the literary and the cultural levels, and whose consequences were felt, though we are not too sure that they have been fully pursued and taken to its outermost transgressive limits. As Alberto has repeated often, the issues on the end of the 1990s and the beginning of the 2000s are still among us, but we have yet been able to deal with them radically, which means, to deal with them without just reproducing the constitutive limited structures and categorical systems that have informed Latinamericanism and Hispanism at large through the twentieth-century. In this sense, Línea de sombra is an unfinished intervention. In part because it did not produce many interlocutors and readers when published, or perhaps because it was taken (and it is understood as such still today) as a book that transgressed the ‘Latinamericanist reason’, opening itself to a region of thought that was in itself undisciplined, savage, and for the same reason, considered an outlaw intervention (and we should keep in mind this tension between thinking and law). It does not matter. But what really does matter is that we consider the silences around Alberto’s intervention not as a personal affair, but as a particular effect of a certain disposition of hierarchies and prestige within the contemporary university. As if Línea (and the other books) were dammed from the beginning due to the constitutive limitation of Hispanism and due to the lack of interest in theoretical approaches coming form Latinamericanism, a field that was usually identified with the exoticism of political conundrums and the curiosities coming out of Third World countries. Of course, the reverse side of this underprivileged condition of Spanish language for intellectual reflection is that it (re)produces reactive effects. For example, the decolonial option demands a constant revision of the privilege that Spanish has had in the process of representing Latin American realities. However, the paradox arises when this decolonial turn limits itself to the glorification of native languages as if they carry with them a more authentic access to the real, without questioning the self-limitation that both, Latinoamericanist criollo scholars and decolonial ones, show in restricting themselves to the same ethnographic task, avoiding not an explicit politics of identification, but avoiding the most urgent and radical politics of thinking. This politics of thinking doesn’t belong to disciplines and doesn’t follow University structruration. This is what we call infrapolitics. In fact, we recently called this self-imposed limitation in Latinamericanism ‘late criollismo’ in relation to the last manifestations (political practices and historical forms of imagination) of a particular tradition of thought that, reactively, is confronting the dark side of modernity and globalization with a dubious re-territorialization of affects, practices and politics: from neo-indigenism to neo-communitarianism to literary New Rights, from neo-progressism to neo-developmentalism and neo-extractivism. On the other hand, we should not forget it, Spanish was an imperial language, and the current (rhetoric of) privilege for ‘Spanish’ is also at the heart of the neoliberal university. In fact, it is what allows the expansion of the language programs, and by consequence, the expansion of ‘adjunct professors’ and ‘part-time post-PhD students’ that carry departmental duties. An exponential process of subalternization that professors that defend far-away subalterns always seem to forget. One might say, the psychotic decolonial affect is possible by the foreclosure of a minimal distance in favor of the maximization of their subjective drive, in a process of identification that is also a process of libidinal investment and insemination. “El subjetivismo en política es siempre excluyente, siempre particularista, incluso allí donde el sujeto se postula como sujeto comunitario, e incluso ahí donde el sujeto se autopostula como representante de lo universal…el límite de la universalidad en política es siempre lo inhumano. ¿Y el no sujeto? ¿Es inhumano? Pero el no-sujeto no amenaza: solo está, y no excepcionalmente, sino siempre y por todas partes, no como el inconsciente sino como sombra del inconsciente, como, por lo tanto, lo más cercano, y por ello, en cuanto que más cercano, al mismo tiempo como lo ineludible y como lo que más elude” (Moreiras 12-13). So, el no sujeto is an excess of the political subject, an incalculable and unmanageable rest, since the non-subject of the political just is, without a why. Just like the counter-communitarianism cannot constitute a principial determination, the non-subject does not wish to do so either. Indeed, Línea de sombra unfolds a complex instantiation against every nomic determination that guarantees the truth of the idea or the concept. But the non-subject haunts its violence, its transgression. Following our recent encounter with Schürmann’s work, we can say it confronts the latent forgetting of the tragic condition of being. Indeed, the political has rarely been thought against the grain of its nomic and decionist principles, and Línea de sombra was (and still is) an invitation to do so. Our impression is that it is a book that does not want to teach or master anything, but thematizes something that has always been already there, even if some prefer to sublimate it into the principle of satisfaction. The price to be paid for that is quite high. Hence the desire to move thought elsewhere: indifferent to legacy, proper name, inheritance, masters, and subjects. We propose, then, to think collectively these days around the promise, the offer, and the gift of this book, but not necessarily to place it in a central canonical position. Rather we intend to open its questions to interrogate our own historical occasion. Alberto Moreiras. Línea de sombra: el no-sujeto de lo político. Santiago de Chile: Palinodia, 2006. Jacques Derrida. Rogues: two essays on reason. Stanford University Press, 2005. Jean François Lyotard. Why Philosophize? Polity, 2013. *Image by Camila Moreiras, 2016.